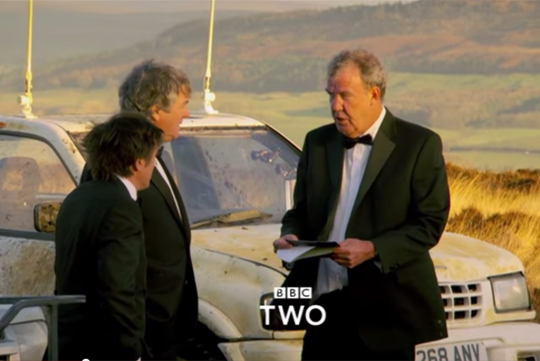 Top Gear fans, the BBC has officially announced that it will air the remaining episodes of Top Gear’s 22nd Season. Yes, Top Gear will return, with Clarkson, May and Hammond doing rubbish stuff and cocking about – as James would describe any given scenario that involves the other two. Expect more epic road trips and challenges from the trio. One of the challenges is an attempt for the trio to become 'lifestyle leisure enthusiasts', with the help of a Jeep Cherokee, an Opel Frontera and a Mitsubishi iO, which the boys bought with a budget of £250 (S$518). Sadly, nobody will ever be able to top the chemistry and entertainment value that the terrific trio of Clarkson, May and Hammond had. Recently, the three even took to twitter to mock Chris Evans after he announced that he was making a secret Top Gear film. Too soon junior! The trio is too valuable to be "sacked".I think BBC is just waiting for things to blow over and dan resume the TG show.